Fourteen south London MPs met with Jeremy Hunt yesterday to challenge whether the NHS Trust Special Administrator actually has the power to make recommendations that would see the closure of Lewisham Hospital’s A&E department. Heidi Alexander, Labour MP for Lewisham East, met with the secretary of state for health last night to summarise the legal and financial objections to the recommendations of the TSA, Matthew Kershaw. His proposals would see the closure of the hospital’s emergency department and maternity services be reduced to a midwifery led birthing unit. According to Jim Dowd, Labour MP for Lewisham West and Penge, Hunt said in the meeting that he would “re-examine the legal case” surrounding Kershaw’s proposals for reducing the debt of the South London Healthcare Trust. Alexander took to Twitter that night, saying that Hunt “reiterated that he is seeking fresh legal advice”. In a document prepared by Alexander, Dowd and Dame Joan Ruddock, Labour MP for Lewisham Deptford, a case was set out for Hunt as to why he should reject recommendation number five, which will directly affect services at the hospital if implemented. Dowd described Kershaw as “shamelessly brazen” following the meeting. Dowd said: “Mr Hunt was predictably non-committal at this stage, simply maintaining that he would look carefully at the plans and re-examine the legal case surrounding the TSA’s meddling with a hospital outside his remit. In the document handed to Hunt, the consultation period was described as a “back-door approach to service re-configuration” and suggested that if every recommendation, except for recommendation five, was implemented then “significant savings can be made without closing emergency and maternity services in Lewisham”. 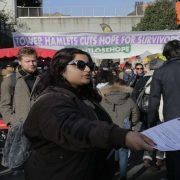 The three Lewisham MPs also argued that the service reconfiguration proposed by the TSA fails all four tests set by the Government, which are: support from GP Commissioners, strengthened public and patient involvement, clarity on the clinical evidence base, and consistency with current and prospective patient choice. The document concluded that the proposals to shut the A&E and reduce maternity services are “dangerous and ill-conceived”. South London MPs will join residents in protest against the recommendations on January 26. 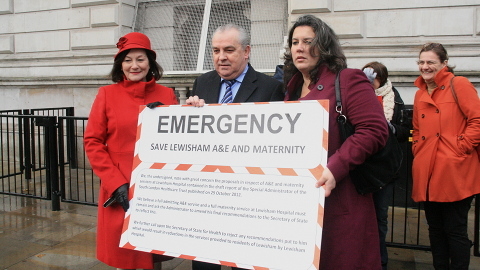 For more information on upcoming Save Lewisham Hospital Campaigns, click here. Nadine Dorries makes me be ashamed to be a Scouser! Trying to undermine the Lewisham protest outside Question Time at Goldsmiths by saying the SWP had highjacked the campaign, which was total rubbish! Its a good job most people think she’s a fool and a rubbish MP. There are people involved in the Lewisham campaign from the SWP and thank god there are! As they tend to by the most hard working and committed campaigners of all, but the vast majority of people involved are local people who don’t want to see there hospital destroyed by the Tories commitment to keep paying off the outrageous PFI contacts. 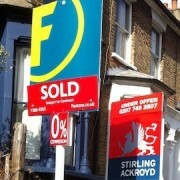 Go back where you come from Dorries!